I love how in Tuscany you are surrounded by grapevines everywhere you go. My husband and I visited late in the summer to capture the area’s beauty on canvas and film. I was drawn to this vineyard outside of Montalcino, home of Brunello wines. 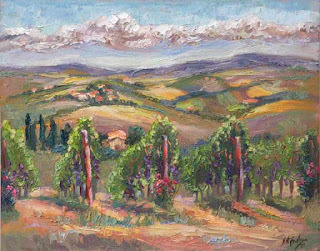 I was attracted to the vibrant vines contrasted against the progressive miles of golden rolling hills dotted with more grapevines, olive trees, and plowed grain fields. The gorgeous, plump purple grapes were ready to harvest at any moment. 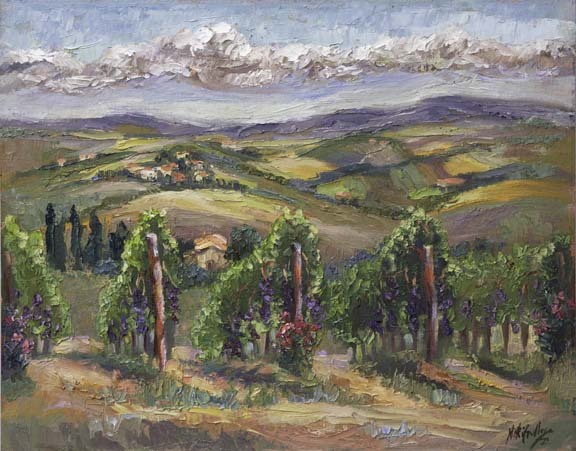 Setting up my easel across from this vineyard, I began recreating the soft light that would break through the clouds and illuminate various hilltops and plantings. I arranged the vines to lead your eye back to the Tuscan villa and then to the beautiful countryside beyond. And when I finished, we treated ourselves to one of their delicious wines. A perfect afternoon!